Royal Challengers Bangalore Faced 7th Lose In 8 Matches !! Virat Kohli’s Selfie Video From Last Year Goes Viral !! Royal Challenger’s Bangalore one of the powerful team in the tournament with having national team skipper in their side almost out of the tournament. Virat Kohli-led RCB are rooted to the bottom of IPL 2019 points table having won only one of their first eight games of the season. The Bengaluru-based team face need to win all their remaining matches (six) if they are to stand an outside chance of qualifying for the playoffs. Only four times in the 11-year history of IPL have teams qualified for the playoffs (or the semi-finals) with 14 points after the league stages. Rajasthan Royals were the latest team to do so when they made the playoffs of IPL 2018 after winning seven matches in the group stages. RCB have 2 points from 8 matches in IPL 2019 and will reach 14 only if they win all their matches from hereon. 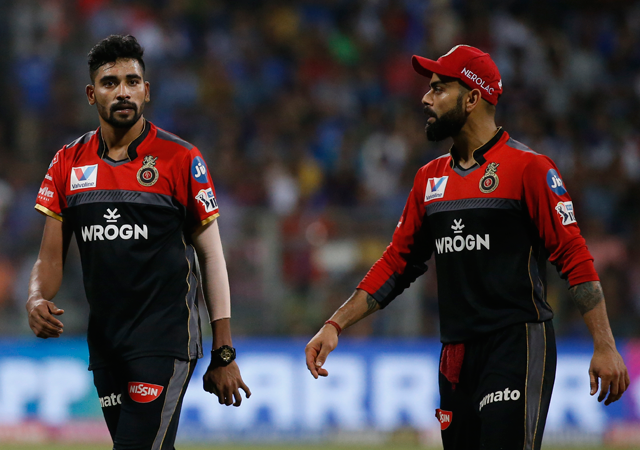 On Monday, RCB suffered a five-wicket defeat to Mumbai Indians despite AB de Villiers and Moeen Ali smashing quickfire half-centuries. RCB’s bowling attack was found wanting once again as Mumbai gunned down a 172-run target with an over to spare. Leg-spinner Chahal was the lone bright spot in RCB’s bowling performance as he finished with figures of 2 for 27. Meanwhile, a video from 2018 where the RCB skipper Virat Kohli promised RCB fans that their team will bounce back harder in the next season goes viral. In the video Kohli is seen asking sorry to the fans and asked them to keep supporting. I really believe in the concept of, “you either win or you learn”. We fought hard and gave it our all but one thing is for sure, next season we definitely will bounce back stronger than ever with our learnings from this season. “We played a pretty good game I guess. With the ball, we weren’t that great in the first six overs but the guys fought hard in the middle overs and came back well,” Kohli said yesterday after losing the match against mumbai. The Bengaluru franchise skipper took a gamble by sending on left-arm spinner Pawan Negi in the 19th over, avoiding his pace bowling options because of the due factor. Against Negi in that over, however, Hardik Pandya bagged 21 runs (a total of 22 runs including a wide), as he sealed the tie for the hosts with an over to spare. “At the end, we had to take the risk with the left-arm spinner, with two right-handed batsmen. Giving pace was risky, especially with a bit of dew. Unfortunately, it didn’t come off,” Kohli revealed. Well, RCB’s story is bit sad this year so far but their prominent spin bowler Chahal hasn’t lost his hope still it seems. In the post match he said that his team still could make it into the play offs. “If we win the next six games we can qualify. Last year a team had qualified with 14 points, so still, we are in the game. You never know what will happen next,” Chahal said in Mumbai. Previous articleBATA Punished For Making A Customer Pay Rs.3 For Carry Bag !! Check Out !! Next articleSanjay Manjrekar Criticized Selectors For Choosing These Tamilnadu Players !! Fans From Tamilnadu Thrashed Him ! !